Review date: 22 May 2005. 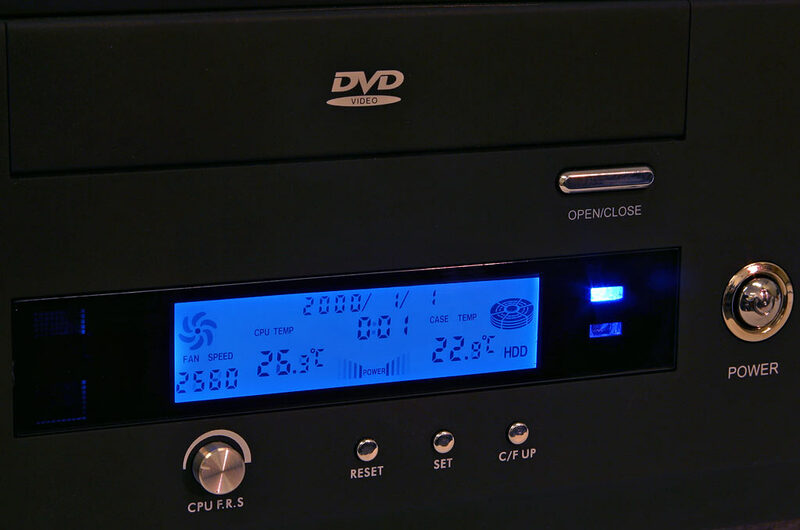 One way or another, more and more people are using Home Theatre PCs (HTPCs). If you want to build your own HTPC, though, you need a suitable case to put it in. Sure, you can stick any old mini-tower in your living room and declare the job done; if you deck it out with low noise fans, it won't even be a bad solution. But if you'd prefer something that looks a bit as if it belongs in your hi-fi stack - and, more practically, will actually fit there with other components above and below it - the options get a bit narrower. 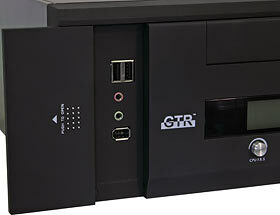 Desktop form factor, probably has to be black. If you want such a case to be cheap, too, you face some problems. There are tons of computer cases out there that come with a power supply yet cost about as much as a large hamburger. 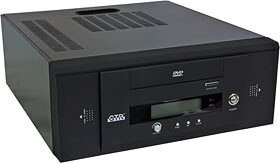 They're generally about as good, and the PSUs about as reliable, as you'd expect; it's not a good idea to build any kind of computer in one of those, and certainly not something like an HTPC, which may well be on all day. So - we're looking for something that'll at least vaguely fit in with your stereo gear, and that's cheap, but not suspiciously cheap, and that preferably isn't too ugly. Perhaps we're looking for this. It's called the B-01, it's from GTR (which, I remind you, stands for Genteelord International Limited; clearly, Hong Kong companies don't believe in spending money on name consultants), and it's 350mm wide, 385mm deep, and 150mm tall (13.8 by 15.2 by 5.9 inches). So it'll fit into a lot of stereo racks well enough. The price you pay for the small-ish dimensions, though, is that this case can only accept MicroATX (or the not-too-popular FlexATX) motherboards. It's easy to find full-featured MicroATX boards these days, though; you still get four expansion slots, which is plenty for an HTPC unless you want to install eight tuners or something. The B-01 also looks not un-hi-fi-ish. Look! A display on the front! Shiny buttons! 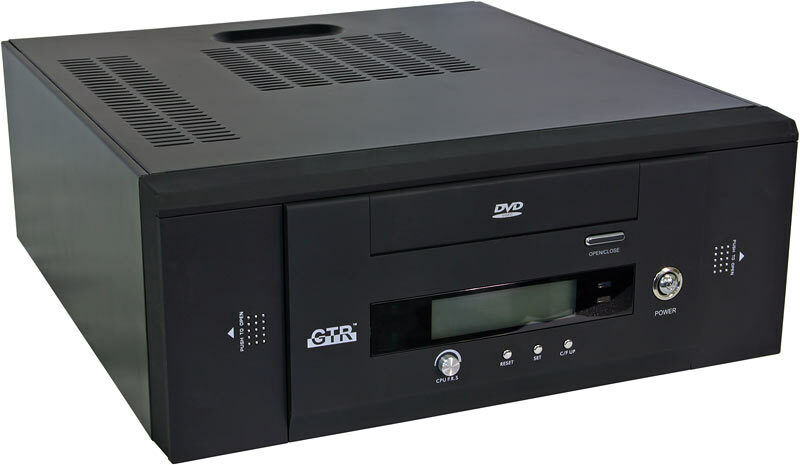 And, here in Australia, Aus PC Market are [or, rather, were; this review's quite old, and this case is not for sale any more] selling the B-01 for $AU115.50, including power supply and delivery in the Sydney metropolitan area. For that price, you can forgive many sins. Will you have to? Close up, the front panel finish is acceptable. Not great, not rubbish - just acceptable. You don't get brushed anodised aluminium for this price, but you do get an OK matte plastic. There are sliding doors on both sides of the front panel. This one reveals a standard collection of front ports - two USB, two audio, one FireWire, all of which hook up via motherboard pin headers, not loopback cables. The other door reveals a vertical 3.5 inch bay, for a floppy drive. In this modern age, it's more likely to stay closed and be used for another hard drive, of course. The backlit front panel display looks rather nice, by the standards of glowy things on cheap cases. It's got a clock (without a backup battery, as you might guess from the displayed date and time...), two temperature monitors (Celsius or Fahrenheit, and yes, the probes are included), an HD activity thing of little value, a discreetly animated power indicator of no value at all, and a fan speed monitor. And there's a knob that lets you change the speed of the monitored fan. As usual for cheap fan speed controls, nine watt Deltas need not apply - but you shouldn't have any high powered fans in an HTPC anyway. The "stealth" 5.35 inch door above the display is one of those one-size-fits-all jobbies that should work OK with pretty much any tray-load CD or DVD drive; it's got the DVD Video logo printed on it, but I think you're allowed to install some other kind of drive if you like. The back of the B-01 - and yes, this one's got a motherboard in it, and no, you won't get a free motherboard with your case - is standard microATX desktop fare. This B-01 also has a 60mm exhaust fan installed; the standard package only gives you the 60mm fan in the PSU. That may be enough to keep a basic HTPC cool - plenty of people use cheap older components for these boxes, and a lightly loaded Socket 370 CPU and 5400 RPM hard drive won't output a lot of heat. Mini-ITX boards fit in MicroATX (and FlexATX, and full ATX) cases too; I'd be more comfortable using one of those if I stuck with only one fan. 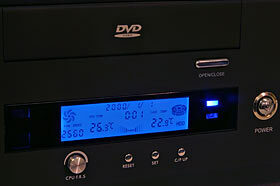 I think it's a better idea to put a second fan in, though; if you hook it up to the CPU fan speed controller, you'll be able to keep it quiet (all things being equal, an exhaust fan will contribute more to computer noise than a CPU fan). 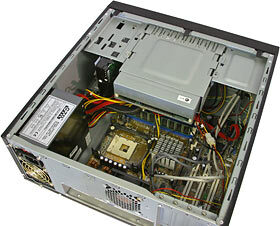 Because the B-01 isn't super-slimline, there's room for that fan, and for full height expansion cards as well. The top of the case slides off in the usual way (it's definitely on the flimsy side, but it'll survive having a stereo component or two stacked on it), revealing a pretty sensible interior layout - here populated with a half-built PC. There are two vertical 3.5 inch bays (one of which is behind the front peekaboo door), and one regular horizontal 3.5 inch spot on the other side. 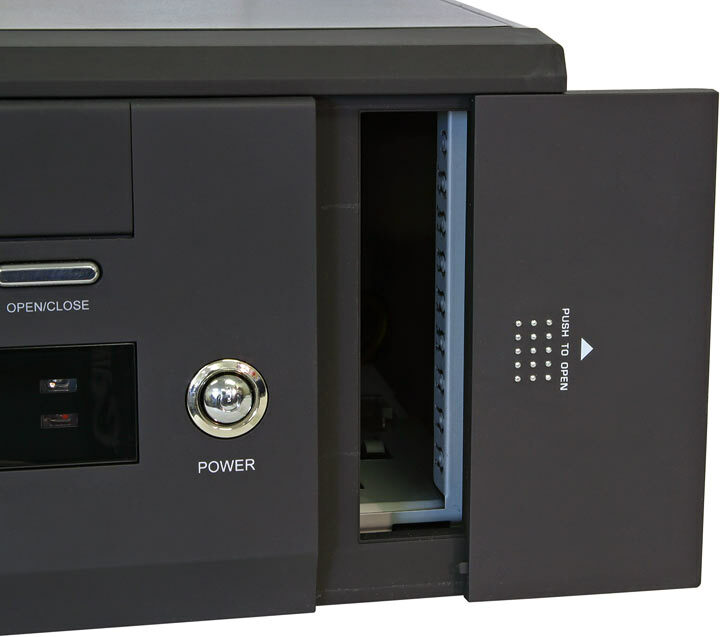 The 5.25 inch cage is removable - which makes it easy to install a drive in it, and also gives you access to the board underneath, and the horizontal 3.5 inch bay. If you don't install an unusually tall CPU cooler, there's basically unlimited room behind the 5.25 inch bay, and there's a reasonable amount of clearance between the 3.5 inch bays and the small power supply, too. If you install three Parallel ATA drives with standard length ribbon cables you're going to end up with something of a air-blocking snarl to clean up, but one PATA DVD drive and one SATA hard drive will make things a lot simpler. 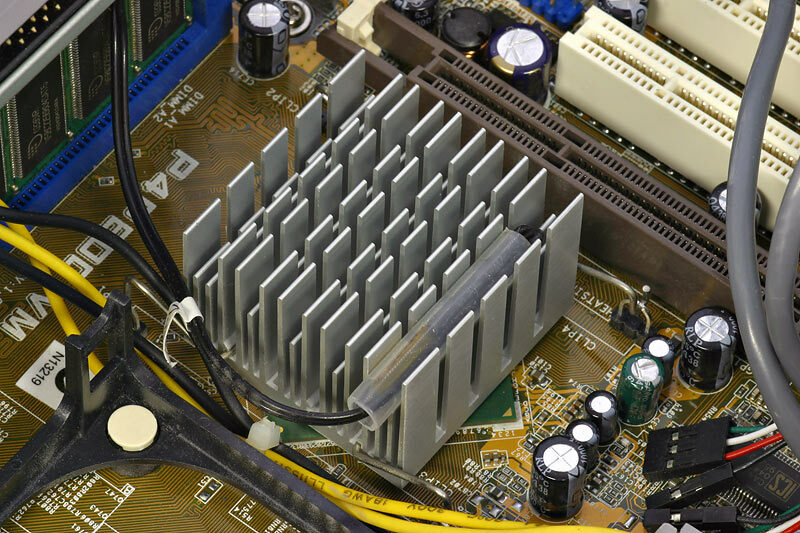 The standard power supply is unusually ballsy, for a bundled small-case unit. The "370 watt" rating sticker has about two-thirds of the information I like to see, but what it does say hangs together - 200 watts for 3.3V and 5V together, and by arithmetic another 170 watts for everything else. 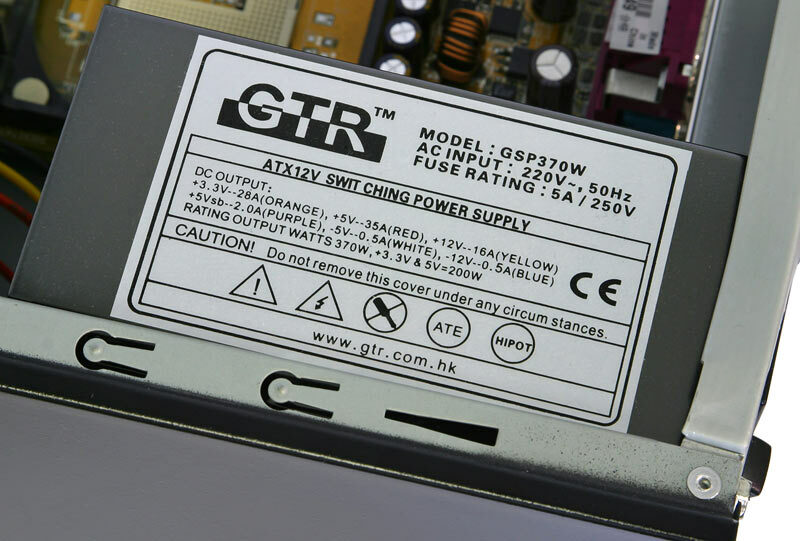 Given the fact that people don't exactly write epic poetry about the long and glorious history of the GTR brand, I'd treat this as a 300 watt PSU, which should be more than enough for any HTPC. 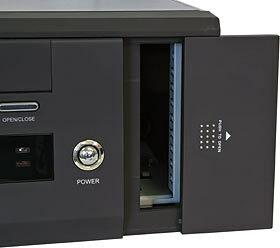 If you're running a hundred watt CPU and a 70 watt video card in one of these cases, you're deranged. On the subject of power - here in Australia at least, the B-01 doesn't come with a power cord. Aus PC Market will be pleased to sell you a suitable Aussie IEC lead for $AU12.10 delivered. The going rate for used IEC leads on eBay's about a buck each, in quantity, ex shipping. Aus PC probably won't be angry with you if you take that option. Here, by the way, is one of the B-01's two thermal probes, here tucked into the motherboard north bridge heat sink. The probe is the usual super-thin kind that you can stick pretty much anywhere; the rubber tube makes quick bodge-job installations easier. It's cheap, it's cheerful, it gets the job done. 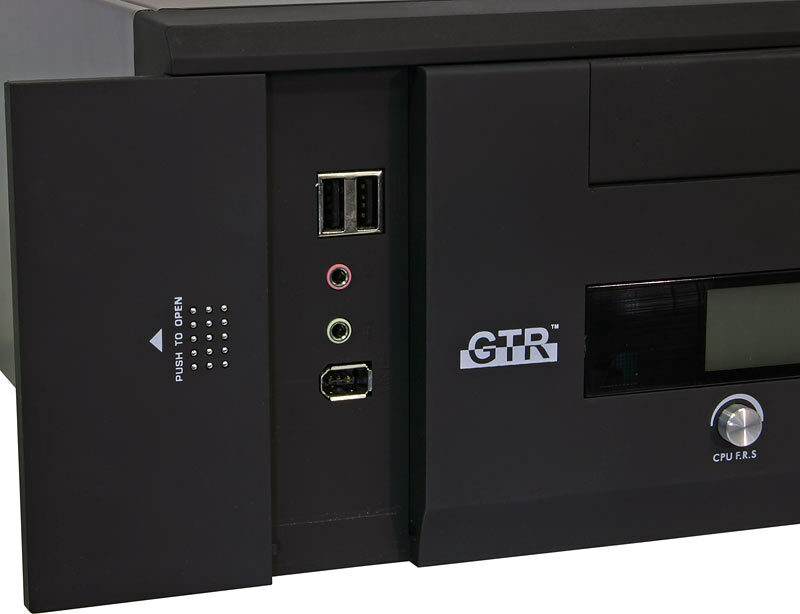 If your HTPC must be a thing of beauty replete with RAID arrays and multiple tuner cards, then the GTR B-01 just won't have enough room for the gear you need, much less achieve the requisite ooh-ah factor. For most HTPC purposes, though, the B-01 will cut the mustard. You can take the cheap way out and use a MicroATX board with integrated everything, or you can install your own selection of graphics, sound and tuner cards, and be confident that the PSU won't scream and explode. And three 3.5 inch bays give you room for a moderately ludicrous amount of local storage; "300Gb" drives are mainstream now, so it'd be no biggie to pack in around 840Gb of formatted space. I'd like the B-01 to have an 80mm exhaust fan spot (more air flow, less noise), and the whole thing definitely does feel as cheap as it is when you're working on it. But this isn't some horrible super-discount case with no right angles, sharp edges all over the place and a PSU Mean Time Between Failures of about 72 hours. From normal TV-viewing distances, it actually looks rather more expensive than it is. Aus PC Market no longer sell the B-01, but they've got lots of other cases!